You can figure out what it will cost to fumigate your home by using the calculations provided. Measure the exterior of the structures length x width x height including any patios or garages or overhangs. 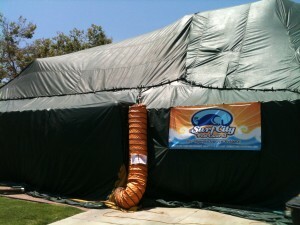 Keep in mind that whatever structures the fumigation tarps cover will be apart of your total volume. This is only intended to give you an idea of your cost. We highly recommend our professional fumigator meet with you and measure up your property.